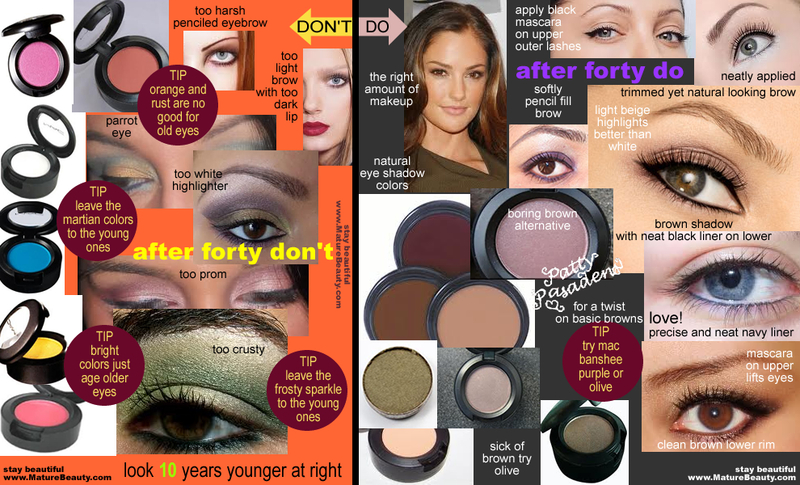 Eye shadow do’s and don’t for anti aging after forty, fifty and sixty. These tips for how to apply eye shadow, mascara and eye liner pencil when you are older than forty. A neat, precise application is key. The result is a look younger illusion! Here are some makeup tips on how to apply eye shadow after forty. The best eye shadow colors are natural. Use mascara at upper outer lashes and precision eye liner inside the lower lid rims. Try mineral makeup brand colors that are earthy yet rich in color. Make sure to purchase the right makeup tools including brushes, sharpener and makeup remover. This article will show women how to use eye shadow techniques for an anti aging cosmetic effect. Choose natural but rich in tone colors and try mineral makeup shades for a flattering effect. Playing around with eye shadow is part of the fun of applying your makeup. However if you really want to anti age your look, the swirling colors must go. The only actress that wore bright shadows after fifty that I can recall was Elizabeth Taylor. That was her signature look, the bright blue shadow and the red lips. I am not sure how much those colors really flattered her, but in her case, that was her classic uniform. For most women, bright shadows only serve one purpose and that is make them look years older than they should. That’s not to say that you want to go too neutral on the colors, because then you won’t even look like you have makeup on at all. You have to find the balance. Rest assured, rich in tone neutral colors are the most universally flattering on older women regardless of their eye color. Most makeup brands sell the trio eyeshadow packs of light, medium and dark tones. A due or trio is supposed to ensure that the tones are from the same family of colors and are complimentary to one another. That said, I don’t like the duos or trios at all. For an older woman at least one of the colors in the trio or duo is probably going to be too off the mark and way too bright or dark for her skin tone. Not only that, if you try to put on all three colors you can wind up with an unblended line or too much makeup up near your eyebrows. See photos at left for badly applied trio eye shadow. I’d skip the trio packs and just go for a few tried and true shadow colors. Buy individual colors instead. That way you can buy different shades that are still a close and natural match to your skin. If you aren’t good at picking makeup colors then look at the right of the photograph to see the beige, tan, stone, taupe, grey and brown tones that are universally flattering. Go to the MAC or Sephora counter at your local department stores and ask a makeup specialist for a few good shades to try. Sometimes these neutral taupe shades are the best and you’d overlook them on your own. The makeup counter specialists know how these basic shades work though. I also like the mineral makeup brands that are sold online and through infomercials. Since mineral makeup manufacturers are totally into the natural look their color schemes are usually earthy and pretty. Even the cheaper mineral makeup clones at the drugstore have good color choices to pick from. Your eye shadow colors should complement each other nicely. If you dare to wear more than one shade, make sure that the colors blend together seamlessly. You don’t want to see a color change line. See models at left wearing bright duos and trios and they look like they are in drag. It’s over kill. Another tip is to keep the shadow a bit away from the underneath of your eyebrows. Leave a space there and don’t let the makeup creep into your eyebrow hairs, yuk! Keep eyeshadow very, very neat. If you get smudgy it’s going to add to the dishevelment of an older face. Add makeup smudge to wrinkles, dark bags, and fine lines and you risk looking like a bum. To keep things neat as a pin have your tools in tow. You’ll need a good quality metal sharpener to keep any eyeliner pencils in perfect sharp to apply form. Always have Q-tips in a carry container and makeup remover on hand to clean up all edges of the shadow and get it away from the rest of your face and your under eye area. My daughter found a great blue liquid makeup remover from Sephora that she uses with a Q-tip. I use a Q-tip and dot it onto a Noxzema blemish pad which works good as a cheap makeup remover alternative. Use good quality brushes always. Throw away the ones that come with the shadows that you get from the drug store. You can get a makeup brush set from the Rite Aid but you need to be careful with cheap brushes. If they are cheap then the hairs on the brush will come loose and the tips will be too soft and mushy. Sometimes the drugstore brush tips are just too flimsy making for a sloppy application. I say invest in a few really high quality shadow brushes from the MAC counter. Get ones with really fine angle tips and thin broomstick edges so you can apply shadow neatly and mess proof. I’d buy at least two brsuhes, one for light colors and one for darker shades. A neat and precise makeup application is a really big deal for older women. The neater your makeup looks, the younger you’ll look. Invest in really good tools. Always use a pin sharp eyeliner pencil. Purchase good quality eyeliner pencils because the quality pencils have far more pigment and stick better to stay fade free all day. Wet n Wild and NYX are fantastic bargains for cheap makeup but when it comes to eye liner pencils the cheap brands are a no go. When it comes to eye liner pencils it’s worth the cost to move on up to a better brand with higher fade free mineral pigment. I like liner in the inside water rim of the lower eyes. Since there is tear water there a lousy pencil color will fade right off in a matter of hours. Lining the lower water rim makes the eye more defined without dragging it down into the under eye flaws. Definitely use good black mascara and wiggle the brush to make the upper outer lashes fan out. The upper outer lashes are the most important focal point if you want to lift your eyes with mascara. Bottom lashes really don’t need the mascara too much as you don’t want to drag the eyes down into a raggedy-ann look. Mascara on the upper lashes especially applied to the outside lashes, and neat as a pin liner on the inside rim of the lower eye lid is going to look precise and clean. That is the anti aging effect you want. See the lady with the blue eyes at right in the photo example. She has a neat as a pin eye makeup application that is the quintessential anti aging look. Nice black mascara on the uppers and neat as a pin navy eyeliner on the lower rim. Wow, she looks so amazing! Some women like to highlight the brow bone which is the spot that is directly underneath the eyebrows. It can make your face look more dimensional however don’t make the mistake of using a pure white highlighter. White highlighter looks good on younger women yet over forty it is going to make you look like you are wearing stage makeup. If you want to lighten the brow bone area choose a light, light beige (instead of white) which is going to look far more natural. I have seen Kris Jenner from the Kardashians wearing this skunk black eyeshadow on the Keeping up with the Kardashians show. I actually really like her and she does look fantastic for having six kids. However, I would recommend to women not to wear such dark black eye shadow since it can make you look like you just got punched in the face. That dark black shadow is going to look way too theatrical in real life. When wearing dark shadow don’t cross over the line into the sucker punch. Try a more natural gray color or just use a hint of charcoal and blend it better. Whatever you do, you don’t want to look like you just got bruised. Stay away from jet black eye shadow. Avoid sparkle flecks in your eye shadow like the plague. I like the sparkles however on older skin the flat matte colors are far more flattering. Besides, if you wanted to add sparkle you would do it with a separate highlighter rather than have it embedded into the shadow. Frosty shadows look horrible on women over forty. It’s way too crusty the clown. Also avoid all prom and pageant colors. I have nothing against them but they just don’t look good on older women. If you actually look at some of the makeup brands that are geared towards mature women such as Laura Mercier, Bare Minerals or Lauren Hutton face disc natural makeup from HSN, you will see that they always stay away from neon colors and sparkles. Why? Because they don’t look good on older women. Enough said. Beware of copper and gold as alternatives to brown, as they tend to look orangey and that is a classic old lady look you want to avoid as well. Pinkish and orangish are not good. As boring as the neutral colors can be, they just look good. Another pointer is that you should not go too overboard on the neutral thing to the point of invisible. Make sure your browns and beiges have rich tones and make your eyes pop. If you get shades that don’t even show you’ll still look washed out. You want to accentuate your eyes and minimize other flaws so invisible beige alone won’t cut it. Go for natural shades that nonetheless have rich tones to them. Remember that you are showcasing your beauty and not the makeup. If the makeup colors don’t stand out it’s perfectly ok but they still need to do their job which is to lift the face, conceal flaws, and divert attention from wrinkles and aging. Applying shadow just under the lower eye can add drama however the likelihood of that shadow descending and bleeding into your under eye wrinkles and winding up as smudge mess is very high. I like a neat liner on the inside rim of the lower eye and that’s about it. If you want to add a little drama you can apply a little shadow just under especially at the outer edges for a cat eye dramatic effect. If you do that for evening, make gosh darn sure that you apply it with a brush that is sharp, sharp, sharp angle tipped and precise. Clean up around it too. As you age the neater your makeup looks and the more precise you can apply natural colors, the better off you’re going to be. Buy good makeup brushes, pencil sharpeners and spot removers if you are a makeup klutz. Use your reading glasses or a magnifying makeup mirror if you are quasi blind. If you feel as though you are stuck in the brown color rut, there are some variations that can be wearable and make your eyes pop without looking like you are on the baby Tiara’s show. Try shades of gray, olive, and earthy purple for practical eyeshadow variations. For eyeliner, brown, black or dark blue looks pretty. Lancome has a navy blue eyeliner called Black Lapis that I love. It costs a pretty penny but the color is great and it stays on all day. Spend a little more money than usual on eyeliner because if the liner has good mineral ingredients in it the color will be more intense. Revlon HIP high intensity liners has good pigment if you are on a Rite Aid budget. Physicians Formula mineral makeup eyeliners are also decent. MAC is always good too. Do you like my beauty tips? Leave a comment blow as I always need encouragement to continue with this blog. I am forty nine pushing fifty these days. Readers, please send me some love! Comment below. This is just what I have been looking for!!!!! I am 52 and my drawer is crammed with eyeshadow trios and quads and I think I have to use every color. I have become so sick of looking crazy and overly made up. I have, however, discovered navy eyeliner and found it to be a good complement to my dark brown eyes. Ok, any suggestions on who makes the best neutrals? Also I have so many fewer eyelashes than I did yesterday, it seems that way to me, mascaras clump and i dread applying it. Any suggestions in that area? Love your blog. I am a super beauty product freak going back to my teenage years. This is a dream come true for me. Keep writig. YOU HAVE SOME WONDERFUL MAKEUP IDEAS THAT MAKE SENSE. i AM FAIR, HAVE BLUE EYES AND HAVE FRECKLES. i HAD TRIED BROWN EYESHADOWS SEVERAL TIMES AND DIFFERENT SHADES. THEY ALWAYS MADE ME LOOK TIRED..I LIKE YOUR EYESHADOW SUGGESTIONS..I HAD ALSO TRIED GOLD AND COPPER SHADES WITH NO LUCK. I AGREE THAT I DIDNT WANT TO LOOK WASHED OUT BUT WANT TO LOOK NICE WITH MAKEUP..BUT NOT OVERDONE. I THINK YOU ARE DOING A GREAT JOB TO HELP US MATURE LADIES LOOK GREAT. DO YOU THINK I COULD WEAR THE OLIVE EYESHADOWS OR SHOULD I AVOID THOSE COLORS SINCE I AM FAIR??? I HAVE ALWAYS LOVED MAKEUP AND WANT TO LOOK THE BEST THAT I CAN FOR MY AGE…I AM NOT ONE OF THOSE WOMEN WHO WANT TO LOOK 20..WHEN I JUST WANT TO LOOK LIKE I HAVE MAKEUP BUT NOT OVERDONE..THANKS SO MUCH FOR YOUR HELP AND SUGGESTIONS..PAM WINTER.